Do what they can, they cannot quell the soul. I VERY cordially call attention to this account of the work of one of the field sections of the American Ambulance in France, told out of his own experience by a young man, a graduate of the University of Virginia, who has been driving an ambulance at the front. The article came through Hon. A. Piatt Andrew, formerly Assistant Secretary of the United States Treasury, and for two years treasurer of the American Red Cross. Mr. Andrew has taken an active part in the organization of the work. He writes that many American college graduates are engaged in the field sections, and that they and others "have been working for months with a devotion and courage which have commanded glowing tributes of gratitude and admiration from many French officers." In a second letter Mr. Andrew states that the faithful Mignot (spoken of in this article) was killed when the Germans bombarded the headquarters of the field section. Every young man just leaving college --- from Harvard, from Yale, from Princeton, from Michigan, Wisconsin, or California, from Virginia or Sewanee, in short, from every college in the country --- ought to feel it incumbent on him at this time either to try to render some assistance to those who are battling for the right on behalf of Belgium, or else to try to fit himself to help his own country if in the future she is attacked as wantonly as Belgium has been attacked. The United States has played a most ignoble part for the last thirteen months. Our Government has declined to keep its plighted faith, has declined to take action for justice and right, as it was pledged to take action under the Hague Conventions. At the same time, it has refused to protect its own citizens; and it has refused even to prepare for its own defence. It has treated empty rhetoric and adroit phrase-making as a substitute for deeds. In spite of our solemn covenant to see that the neutrality of unoffending nations like Belgium was not violated; our solemn covenant to see that undefended towns were not bombarded, as they have been again and again bombarded in France, England, and Belgium, and hundreds of women and children killed; our solemn covenant to see that inhuman and cruel methods of warfare --- such as the use of poisonous gas --- were not used, we have, in a spirit of cold, selfish, and timid disregard of our obligations for others, refused even to protest against such wrongdoing, and, with abject indifference to right, the professional pacifists have spent their time merely in clamoring for a peace that should consecrate successful wrong. What is even more serious, we have wholly failed to act effectively when our own men, women, and children were murdered on the high seas by the order of the German Government. Moreover, we have declined to take any effective steps when our men have been murdered and our women raped in Mexico --- and of all ineffective steps the last proposal to get Bolivia and Guatemala to do what we have not the manliness to do was the most ineffective. But there have been a few individuals who, acting as individuals or in organizations, have to a limited extent by their private efforts made partially good our governmental shortcomings. The body of men and women for whom Mr. Andrew speaks is one of these organizations. I earnestly hope that his appeal will be heeded and that everything possible will be done to continue to make the work effective. 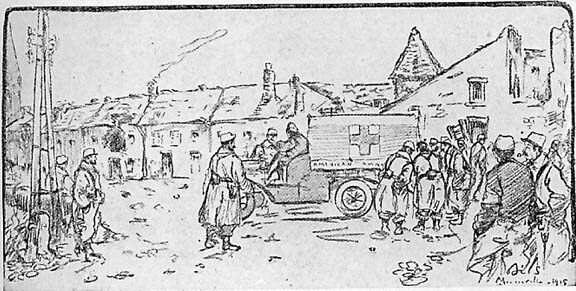 A small field ambulance with a large red cross on each of its gray canvas sides slips quickly down the curving cobblestone street of a quaint old French frontier town, and turns on to the road leading to the postes de secours (dressing-stations) behind the trenches, which are about two kilometres distant. The driver is uniformed in khaki, and is in striking contrast to the hundreds of blue-gray-clad soldiers loitering on the streets. A group of little children cry out, "Américain," and, with beaming smiles, one of them executes a rigid though not very correct salute as the car goes by. A soldier yells, "Good-morning, sir" another, "Hello, Charley!" and waves his hand, while others not gifted with such an extensive command of English content themselves with "Bonjour! " and "Camarade!" The little car spins on past companies of tired, dusty soldiers returning from the trenches, and toots to one side the fresher-looking sections that are going up for their turn. A sentinel stands out in the middle of the road and makes frantic motions with his hand to indicate that shrapnel is bursting over the road ahead. "I should worry," comes from the driver, and the car speeds serenely along the way. It is an ambulance of the Section Sanitaire Américaine, 3, the squad that has just been cité à l'ordre de l'armée (honorably mentioned in despatches). The drivers of these cars are all American volunteers: young men who, for the most part, come from prominent families in the States. All parts of the Union seem to be represented. The Sections are composed of from fifteen to twenty-five cars each, and are under the direction of a Section commander. 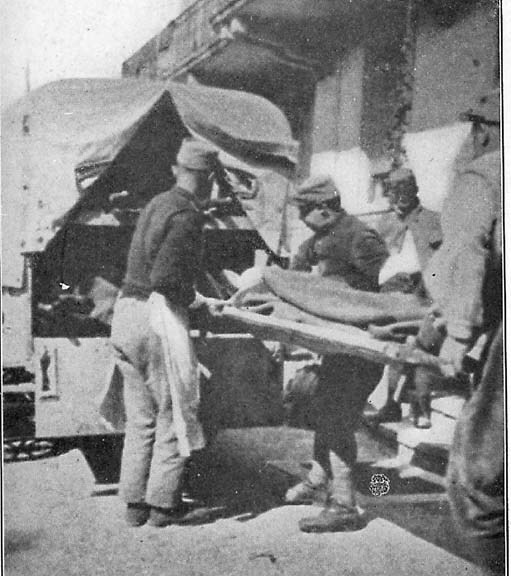 While the cars are allotted to the Sections by the American Ambulance Hospital, directed by its officers, and in part supported by the organization, they nevertheless become an integral part of the Sanitary Service of the French army, to which they are assigned as soon as they enter the war zone. The cars and conducteurs, as the drivers are called, are militarized, and all general orders come from the French medical officers. The French Government supplies the gasoline, oil, and tires, and the personnel of the Sections are housed and fed by the army. They are given the same good food and generous ration that the French soldier receives. Attached to each Section is a French non-commissioned officer who attends to various details and acts as interpreter. Section 3 is favored by the addition of an army chef, and the Section commander's orderly has been put in the general service of all the members. It is forbidden to give the location of any of the active units of the French army, and as this restriction holds good for Section 3, which is at the very front, I cannot give any details that would indicate the point in the line where the Section is stationed. I believe it is allowable to say that the town is very old and possesses a rare beauty. I have never seen a place that could boast of such a number of exquisite gardens or such a lovely encircling boulevard. The surrounding hilly country is charming and pregnant with the most romantic historical associations. Its reputation as a history-making region is certainly not suffering at the present. The Americans are quartered in a large building that had not been occupied since the mobilization in August, 1914. There are countless rooms already furnished, and those on the first floor have been cleaned up so that now the Section, which consists of twenty-four men, has "all the comforts of home." There is a large mess-hall, kitchen, writing-room, library, general office, dormitory, and a good, generous vaulted cellar of easy access. This last adjunct is important, for the town is one of the most frequently bombarded places in the line, and very often big shells that wreck a house at one shot make it advisable to take to the cave. The atelier of the armurier (armorer's workshop), with its collection of tools and fixtures, now serves as a perfect automobile repair shop. There is also running water, and at first we had both gas and electric lights; but shells have eventually put both systems out of commission. Naturally the telephone line gets clipped every few days, but that is essential, and so it is quickly repaired. Behind the headquarters is a gem of a garden containing several species of roses, and, as fortune would have it, new wicker chairs. At first it all seemed too good to be true. It did not seem possible that such an amazing combination of comforts could exist in the war zone, and still less so when one looked down the street and saw the German trenches in full view on the crest of a hill fourteen hundred yards distant, where at night rifle flashes are seen. To Section 3, that had hibernated and drudged along at Beauvais some thirty-five kilometres behind the line until April, it was a realization of hopes beyond belief. Of course, as far as the comforts are concerned, all may change. Any minute orders may arrive that will shift us, and then it may mean sleeping on straw, occupying barns or any available shelter; but while the present conditions obtain we beg to differ with Sherman! A French Motor Ambulance Section had been handling the wounded of the division to which our squad was attached, and we at first supplemented their work. To start with, French orderlies went out with the American drivers on calls to show them the working of the system, but after two or three days the Americans fell into the work as if it had been a life's practice, and, in spite of a lack of conversational ability, managed to evacuate the wounded without a hitch. The Americans did their work so well that they obtained the entire confidence of the authorities, and in a few weeks the French Section was transferred to another post. It speaks very well for Section 3 that all of the work of one of the most important points in the line was entrusted to it alone. In addition to the actual carrying of wounded, there is a remarkable amount of detail office work; for every report, request, or order has to be made in triplicate, and it keeps the commander of the Section, his assistant, and the maréchaux des logis, supplemented by a corporal and telephonist, very busy running the business and executive end. Then, in addition to the proper despatching of the regular and special services, there are hundreds of delicate situations to handle: requests of the authorities, the satisfying of numerous officers, and the reception of the various dignitaries who come to visit the much-heralded American Section. It is only on account of the exceptional ability and capacity of our diplomatic commander, "Ned" Salisbury, of Chicago, that the Section has been entrusted with such vital responsibilities and that it has been able to perform them with such success. 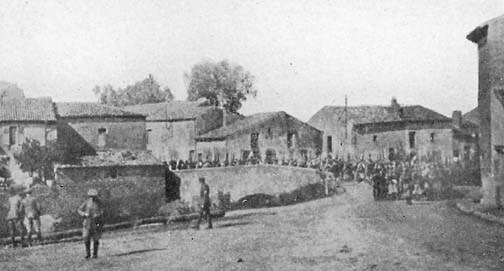 All the men in the Section had been billeted at houses in a town eight kilometres below, where they slept when not on night duty; but when the French Section was ordered away, a number of the men elected to move up to the advance point, and were given excellent quarters in the various vacated residences of the town. Why, instead of just rooms they had suites, and the commander has an apartment in the show place of the town. It is surrounded by extensive walled grounds which have been made into a ravishing garden of flowering shrubs and trees; little lily-covered, iris-bordered lakes, masses of roses, beds of poppies, and in one sylvan nook is a flower-covered fountain fashioned of great rough stones whose tinkling waters tumble in glittering cascades between riots of vivid-colored plants and dense walls of variegated verdure. To see our commander sitting in his Louis XV furnished rooms, which, by the way, have an excellent trench exposure, reminds me strongly of those paintings which depict generals of 1871 disporting themselves in the splendor of a commandeered chateau. From all the foregoing it must not be imagined that Section 3 has a sinecure, or that strolling around gardens is a habit. Far from it. The regular daily service is arduous enough in itself, for one is either on duty or on call all of the time; but there are times following an attack when the men rest neither night nor day, when one gets food only in snatches, and frequently days at a time will pass when one is on such continuous service that there is never a chance to undress. Then there is the other aspect, the ever-present danger of being killed or wounded that one is under at the front, for Section 3 works and lives in a heavily shelled area. But we will not talk of that, for it is unwise to think of such a thing when facing it. There are times, however, when one is forcibly reminded, and when it takes a great amount of will power to remain calm and perform one's duty. The mention of shell fire to one who has never experienced it brings to mind, in a vague sort of way, an association with danger, but that is all. To us who have seen its effects---the hideously mangled killed and wounded, the agonized expressions and streams of fast-flowing blood, the crumbling of solid houses into clouds of smoke and dust; to us who hear the terrible tearing, snarling, deep roar of great shells as they hurtle down the air-lanes towards us to detonate with a murderous, ear-splitting crash, flinging their jagged éclats for a half-mile in all directions, and sometimes killing French comrades near us; to us who live and work within shell range, not knowing when we too may be annihilated or maimed for life, it seems a very real and terrible menace, and for that reason to be banished from our thoughts. In spite of the danger, the Americans render their service with fidelity at any and all times. A French captain once remarked that, no matter how much the town was being shelled, the little field ambulances could be seen slipping down the streets, past corners, or across the square on their way to and from postes de secours back of the trenches. I remember one day that was especially a test of the men. The town was being shelled, and it happened that at the same time there were many calls for cars. The Germans were paying particular attention to the immediate surroundings of the headquarters, and the shells were not falling by any time-table known to us. A call came in, and the next man was handed his orders. He waited until a shell burst and then made a run for it. Several cars had been out on calls and were due to return. There was no way of giving them a warning. We heard the purr of a motor, and almost immediately the sing of a shell very close to us. There was an instant of anxiety, an explosion, and then we were relieved to see the car draw up in line, the driver switch off his motor and run for our entrance. He held his order card in front of him as he ran. Just as he entered another shell hit near by. It reminded me strongly of a scene in a "ten-twenty-thirty" martial play. All the hero needed was some fuller's earth to pat off his shoulders when he came inside. There were several entrances of this sort during the after noon, and one shell, landing just in front of us and nearly on top of a passing motor lorry, resulted in the addition of the French driver and his aid to our little wall-protected group. It was a day when the shelling seemed to be general, for shrapnel and small 77 shells were also bursting at intervals over and in a little town one passes through in order to avoid a more heavily bombarded outer route on the way to the postes de secours. It was magnificent descending the hill from the postes that afternoon. To the left French 75 shells were in rapid action; and one could see the explosion of the German shells just over the crest of the long ridge where the batteries were firing. It was a clear, sparkling day, and against the vivid green of the hills, across the winding river, the little white puffs of shrapnel exploding over the road below were in perfect relief, while from the red-tiled roofs of the town, nestling in the valley below, tall columns of black smoke spurted up where the large shells struck. Little groups of soldiers, the color of whose uniforms added greatly to the picture, were crowded against the low stone walls lining the road to observe the firing; and one sensed the action and felt the real excitement of the sort of war one imagines instead of the uninteresting horror of the cave-dweller combats that are the rule in this war. It is difficult to take any one day's work and describe it in the attempt to give an adequate picture of the routine of the American Section, for with us all days are so different. The background or framework, the schedule of runs, the points of calling, the ordinary duties, are more or less the same; but the action and experiences, which add the color, are never alike. There are days at a stretch when the work might be called monotonous, were it not for the fact that there is a continual source of pleasure in feeling that one is being of service to France, and that one's time is being spent in relieving the suffering of her brave wounded soldiers. Six-thirty is the time for bread and coffee, and the long table in the flag-decorated mess-room begins to fill. Mignot, our comrade orderly, is rushing to and fro placing bowls in front of those arriving, and practicing on each the few English expressions he has picked up by association with us. Two men of the Section enter who look very tired. They throw their caps or fatigue hats on to a side table and call for Mignot. They have been on all-night service at M----, the hamlet where the most active postes de secours are located. "Much doing last night?" asks one of the crowd at the table. "Not much. Had only sixteen altogether." "Yes; Fritz eased in a few shrapnel about five-thirty, but did n't hurt any one. You know the last house down on the right-hand side? Well, they smeared that with a shell during the night." "By the way," continues the man in from night service, addressing himself to one across the table, "Canot, the artilleryman, was looking for you. Says he's got a ring for you made out of a Boche fuse-cap, and wants to know if you want a Geneva or Lorraine cross engraved on it." The men in the Section leave the room one by one to take up their various duties. There are some whose duty it is to stay in reserve, and these go out to work on their cars. Others are on bureau service, and they remain within call of the telephone. Two leave for D----, a town eight kilometres below, where their job is to evacuate from the two hospitals where the wounded have been carried down the day and night before. This town, too, suffers an occasional bombardment, and wounded are left there no longer than necessary. They are taken to a sanitary train which runs to a little village a few kilometres below, which is just beyond the limit of shell fire. Sometimes our cars are called upon to evacuate to X----, which is a good many kilometres distant. The splendid road runs through a most charming part of the country. Just now everything is in bloom, and the gentle undulating sweep of highly cultivated fields is delineated by plots of yellow mustard plants, mellow brown tilled earth, and countless shades of refreshing green, while near the tree-bordered road one can see stretches of waving wheat dotted with the flaming red of poppies and the delicate blue of little field flowers. On those trips it does not seem possible that war is near; but on high, sharply outlined against the deep-blue sky, is a sausage-shape observation balloon, and looking back through a little window in the car one sees the bandaged and prostrate figures of the wounded occupants. There are only two cars on service at M---- during the usual run of days, for unless there is an attack comparatively few wounded are brought down from the trenches to their respective regimental postes de secours in the village. Down the single, long street of this town, which had been changed from a quiet country hamlet to a military cantonment, strolls a motley collection of seasoned soldiers. The majority are uniformed in the newly adopted light bluish-gray; some few still carry the familiar baggy red trousers, black anklets, and long, dark-blue coat with conspicuous brass buttons. The sapeurs and artillerymen wear dull green-and-yellow splotched dusters that make them almost invisible in the woods and impart the most striking war-working appearance to them. There is the cavalryman in his light-blue tunic with pinkish trimmings, and his campaign cloth-covered helmet, from the crest of which flows a horse-tail plume. Here and there are the smartly dressed officers with their variously colored uniforms designating their branch; but their gold galloons of rank do not show conspicuously on their sleeves now, and the braid on their caps is covered. Some wear the splotched duster which hides their identity entirely, and others are dressed in serviceable thin brown uniforms which bear hardly any insignia. In front of four or five of the low masonry houses a Red Cross flag is hung. These mark the postes de secours where the wounded are bandaged and given to the ambulances. An American car is backed up in front of one, and the khaki-clad driver is the centre of interest for a group of soldiers. Some he knows well, and he is carrying on a cheerful conversation. It is surprising what a number of French soldiers speak English; and there are hundreds who have lived in England and in the States. Some are even American citizens, who have returned to fight for la belle France, their mother country. I have met waiters from the Café Lafayette, chefs from Fifth Avenue hotels, men who worked in New York and Chicago banks, in commission houses, who own farms in the West, and some who had taken up their residence in American cities to live on their incomes. It seems very funny to be greeted with a "Hello there, old scout!" by French soldiers. "Well, when did you come over?" asks the driver. "In August. Been through the whole thing." "Where were you in the States?" "New York, and I am going back when it is over. Got to beat it now. So long. See you later." A few companies of soldiers go leisurely past on their way up to the trenches, and nearly every man has something to say to the American driver. Five out of ten will point to the ambulance and cry out with questionable but certainly cheerful enough humor, "Save a place for me to-morrow!" or, "Be sure and give me a quick ride!" Others yell out greetings, or air their knowledge of English. "Hello, Charley!" heads the list in that department, and "Engleesh spoken" runs a close second. Some of the newly arrived soldiers take us for English, and "Camarade anglais" is in vogue; but with old acquaintances "Camarade américain," cried in a very sincere tone and followed by a grip of the hand, has a very warm friendship about it. Yes, you make good friends that way. Working along together in this war brings men very close. You find some delightful chaps, and then . . . well, sometimes you realize you have not seen a certain one for a week or so, and you inquire after him from a man in his company. "Where is Bosker, or Busker?-I don't know how you pronounce it. You know, tall fellow with corporal's galloons who was always talking about what a good time he was going to have when he got back to Paris." "He got killed in the attack two nights ago," replies the man you have asked. And you wonder how it happened exactly, and what he looks like dead. In front of a "poste de secours"
Some days it is very quiet up there at the postes de secours-even the artillery to the rear is not firing overhead; and at other times it is rather lively. Soldiers will be sauntering up and down the long street, collecting in groups, or puttering around at some task, when suddenly there is a short, sharp, whistling sound overhead and a loud detonation as the well-timed shrapnel explodes. The aggregation does a turning movement that for unison of motion could not be excelled, and packs against the houses on the lee side of the street. There are some who do not bother about such a comparatively small thing as shrapnel, and keep to their course or occupation. I have seen men continue to sweep the street, or keep going to where they were heading, in spite of the fact that shrapnel whistled in at frequent intervals. I have also seen some of these immovable individuals crumple up and be still. One evening the firing was so heavy that every one had sought the protection of the walls, when down the street came a most gloriously happy soldier. He was taking on up the street carrying a bottle, and at every explosion he waved his free arm and a wild yell of delight issued from his beaming face. It appeared to entertain him hugely, as if a special fireworks exhibition had been arranged on his behalf. It always seems to be that way. A sober man would have been killed on the spot. With shells it is a very different story than with shrapnel. One can avoid the latter by backing up against a house, but the shells are apt to push it over on you. When the deeper, heavier whistle of a shell is heard, it sounds a good deal like tearing a big sheet of cloth. Men do not brave it. They know its hideous effects, and take to the nearest cellar or doorway. The first one or two that come in, if well placed, often claim victims. A group of soldiers will be talking or playing cards in front of a house. There is a swish; the shell hits the hard road in front of them, and the jagged éclats rip into the little crowd, sometimes killing three or four of them. The soldiers who find themselves at a greater distance have time to throw themselves flat on the ground, and it is seldom that the singing fragments do not pass well overhead. It is quite remarkable that none of the Americans have as yet been hurt at X---- , for the evacuation of the wounded goes on regardless of the shelling. Often the escapes have been very close. Just yesterday ten big shells came in, killed six men and wounded forty others, and yet our two cars on duty there escaped without being hit. One day, following an attack, the firing was rather frequent. Nearly all of the ambulances were lined up in the village waiting for the wounded to be brought down. Our commander was talking to one of his drivers when a shell exploded on the other side of a wall behind him. He walked down the street to give instructions to another man. A shell hit the roof of a house there and covered the two with débris. He started to return, and as he passed a certain house a shell went right into it. They seemed to be following him. It frequently happens that an ambulance will be running down the street and a shell hit a house just behind or in front of its course. Now and then one's breath will stop when a car is enveloped in the clouds of dust and débris coming from a shell-hit house, and start again when from the haze the driver emerges dirty but smiling. Of course, the cars have been hit. A shell tore off the front top of one ten inches from the driver's head, but as yet no member of the American Section has been hurt. A kilometre up the climbing, winding road is a lone poste de secours in the woods just off the highway. The approach and the place itself are often shelled. There have been times when the drivers were under a seriously heavy fire on night duty; times when trees have been shattered and fallen across the road and huge craters made in the soft earth of the adjacent fields. A kilometre beyond is still another point of call, and from there one can look directly into one of the most fought-over sections of ground in the long line from the sea to Belfort. It is a bit of land that before the war was covered with a magnificent forest. Now it is a wilderness whose desolation is beyond description. It is a section of murdered nature. The black, shattered things sticking up out of a sea of mounds were at one time great trees. There are no branches on the split trunks now. No green can be seen anywhere. Where the trenches ran there are but series of indentations, jumbles of splintered trench timbers, broken guns, rusty fragments of shells, strips of uniforms and caps, shoes with a putrid, maggot-eaten mass inside. It does not seem possible that life could ever have been there. It looks as if it had always been dead. What testimony to human habitation remains is but mute and buried wreckage. This last poste de secours is in the very line of fire, but then there are bomb-proofs near by and one can find shelter. One must be careful running up to this poste, for new and very deep holes are continually being blown in the road and there is danger of wrecking the cars. Section 3 has performed its duties so well that the work of an adjacent division has been given to it, and in a few days now the little cars will roll past the last-mentioned poste de secours over to the exposed plain beyond and into the zone of its newly acquired activities. The American cars literally infest the roads in the day. They buzz along on calls to the postes, return from evacuations, and keep so busy trying to accelerate the work that a casual observer might imagine that a whole division had been annihilated overnight. 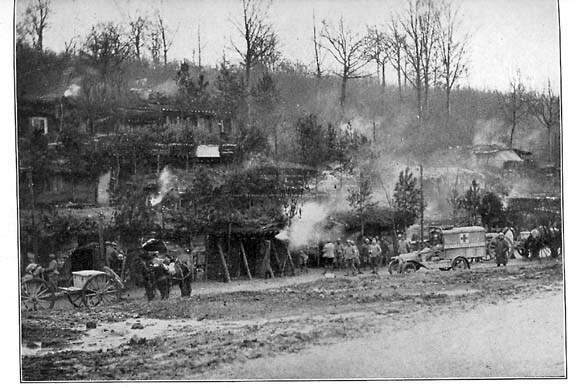 A car with three stretcher-cases in the back, a slightly wounded soldier sitting on the seat next to the driver, and a load of knapsacks piled between the hood and the fenders, starts down from the poste de secours, spins on through a village full of resting troops, and turns on to the highway leading to the evacuation hospitals at the town eight kilometres below. At first the holes in the walls and houses along the way, and the craters in the fields where the marmites had struck, made one continually conscious of the possibility of a shell. Now one does not think about it, save to note the new holes, observe that the older ones have been cemented up, and to hope that an éclat won't hit you at those exceedingly rare times when a shell bursts ahead or behind. The closest call so far on that stretch of road was when a 210 hit eleven feet to the side of one of our cars, but failed to explode. Of course there is a chance that even at that distance the éclat might take a peculiar course and miss one; but the chances are that if that shell had gone off one of our men would have been minus several necessary portions of his anatomy. The work at night is quite eerie, and on moonless nights quite difficult. No lights are allowed, and the inky black way ahead seems packed with a discordant jumble of sounds as the never-ending artillery and ravitaillement trains rattle along. One creeps past convoy after convoy, past sentinels who cry, "Halte là!" and then whisper an apologetic "Passez:" when they make out the ambulance; and it is only in the dazzling light of the illuminating rockets that shoot into the air and sink slowly over the trenches that one can see to proceed with any speed. It is at night, too, that our hardest work comes, for that is usually the time when attacks and counterattacks are made and great numbers of men are wounded. Sometimes all twenty of the Section cars will be in service. It is then that one sees the most frightfully wounded: the men with legs and arms shot away, mangled faces, and hideous body wounds. It is a time when men die in the ambulances before they reach the hospitals, and I believe nearly every driver in the Section has had at least one distressing experience of that sort. Early one morning there was an urgent call for a single wounded. The man's comrades gathered around the little car to bid their friend good-bye. He was terribly wounded and going fast. "See," said one of them to the man on the stretcher, "you are going in an American car. You will have a good trip, old fellow, and get well soon. Good-bye and good luck!" They forced a certain cheerfulness, but their voices were low and dry, for they saw death creeping into the face of their comrade. The driver took his seat and was starting when he was asked to wait. "Something for him, " they said. When the car arrived at the hospital, the man was dead. He was cold and must have died at the start of the trip. The driver regretted the delay in leaving. Why had they asked him to wait? Then he saw that the ambulance was covered with sprigs of lilac and little yellow field flowers. The men knew the car would serve as a hearse. Once an American ambulance was really pressed into service as a hearse in a very touching funeral. A young lieutenant, the son of a prominent and influential official, had been killed in a gallant action. The family had been granted permission to enter the lines and attend the funeral. The young officer, who but a few days before his death had won his commission, was held in the deepest affection by his company, and they arranged that, as something very special, he should have a hearse. A car from Section "3" was offered, and went to the church in the hamlet back of the trenches. The soldiers literally covered the ambulance with flowers and branches, and then stood waiting with the great wreaths they had brought in their hands. The little group emerged from the partly wrecked church, and the flag-covered coffin was slid into the car. The cortège, headed by a white-robed priest and two censer boys, wound slowly down the tortuous path that the troops follow on their way to the trenches. The mother was supported by the father, a venerable soldier of 1870, who limped haltingly on his wooden leg. Back of the two came the lieutenant's sister, a beautiful girl just entering her twenties. The captain of the company was at her side, then followed other officers, and the silent, trench-worn soldiers behind. The funeral halted on the hillside near a grave dug beneath the branches of a budding apple tree. The coffin was pulled from the ambulance and lowered into the grave. And the mother knelt at the side, sobbing. The old father, who struggled to suppress his emotion, began a little oration. His voice trembled, and when at intervals he tried to say, "Vive la France! " it broke and great tears ran down his face. The soldiers, too, were crying, and the American's eyes were damp. Behind, a battery of 75's was firing ---for on no account must the grim details of the war be halted---and at every deafening shot and swish of the shell tearing overhead the girl shivered, huddled close to the captain, and looked in a frightened way at the soldiers around her. In her small, thin shoes and black wavy dress she seemed strangely out of place in those military surroundings. The Americans have a faculty of adapting themselves to any service they may be called upon to perform, and many times they undertake on their own initiative various missions that are not in exact accord with their military duties. They very often transport dead civilians after a bombardment. Though nearly every one takes to the caves when a bombardment starts, the first shells that come in frequently kill a number of people who have not had time to get to shelter. In the past few weeks nearly all the civilians have left the dangerous town, and it is seldom now that soldiers and the residents----men, women, and children---are found mixed up in pitiful dead groups. During one bombardment, some time ago, however, a considerable number of women and children were killed. A couple of the American ambulances were on the spot immediately after, and the men were silently going about their sad work. The little children who cry out to us as we pass were gathered around holding to their mothers' trembling hands. They said, "Américain," when they saw the khaki uniforms, but their tone was hushed and sad instead of loud and joyous, and had a surprised note, as if they had not expected to see the Americans at such a task. In one place a large crowd of people had gathered around an ambulance in front of a baker's shop. In the upper part of the building was a great irregular hole that included a portion of the roof, and inside the freshly exposed stone rims the interior of a room with shattered furniture could be seen. Below the huge rent on the gray face of the building was the fan-shaped design made by the shell's éclats. On the sidewalk were the bodies of two women and a soldier. A vivid red pool had formed around them and was flowing into the gutter. For some reason the gray dust covering the motionless black dresses of the women seemed to make the picture very much more terrible. The face of one of the women had been torn away, but her hair and one eye, which had a look of wild fear glazed in it, remained. As the stretcher the woman had been placed on was carried to the car a yellow comb fell out of her bloody hair and dropped on the white-shod foot of a young girl standing near. The child pulled up her skirts with a disgusted look and kicked the comb off into the street. It took the Americans a long time to learn the value of prudence. At first during the bombardments they would rush to the street as soon as a shell landed and look to see what damage had been done. Then, when some éclats had sizzed uncomfortably close to their persons, they became a little more discreet and waited a while before venturing out. Ten days ago, during a bombardment with the large 210 shells, a few of the Americans were gathered at the entrance to the courtyard of our headquarters to observe the shells hitting in town. It was all very well until quite unexpectedly one hit the eaves of the building at a point about thirty yards from the group and carried away with its explosion about twenty feet of that part of the structure. Fortunately, the éclat took a high course, but great building stones crashed down and blocked the roadway. The Americans were unharmed save for a thick coating of mortar dust, but that experience has discounted the popularity of orchestra seats during an exhibition in which shells larger than 77's appear. One of the men was twenty-five yards from a 210 high-explosive projectile when it carved a great crater in the ground and killed two French Red Cross men near him, and he, for one, has no overpowering desire, after that murderous, crushing, breath-taking explosion, for any intimate personal research work into the effects of other large-calibre shells. Even now the members of Section 3 have much to learn. They still persist in remaining in their chairs in the exposed garden when aeroplanes are being fired at directly overhead, when balls of shrapnel have repeatedly dropped into the flower-beds, and when one man was narrowly missed by a long, razor-edged fragment of a shrapnel shell. And this has not even the excuse of a desire to observe---for the novelty of these performances has long since passed ---and one hardly ever glances upward. They won't even move for a German Taube, though it might at any minute drop a bomb or two. As a matter of fact, however, explosives dropped from German machines are comparatively harmless. When a certain great stone structure on the water's edge is being shelled, the men off duty adjourn to the shore for the entertainment. They know the various schedules the shells run on, and time their arrival. The German guns firing them are so far off that the report cannot be heard. There is a deep, bass, tearing roar, closely followed by another, for they come in pairs; then two huge columns of water hurtle into the air for a hundred feet, accompanied by two heavy detonations. The bleacher-occupying Americans--- they have installed a bench to sit on---then jump up and scurry for a wall that affords protection against the éclats that sing back from the shells. In a second there is a rush for the hot chunks of metal, while the natives emerge from their shelters to collect the fish that have been killed by the terrific concussion---and fish à la bombardement is served to us the next day! For some reason or other the German prisoners--- and the Lord knows there are enough of them these days---still remain a subject of humorous interest to the Americans, while the Boches, as the Germans are called, stare at us in wild-eyed amazement, flavored with considerable venom, thinking us British and wondering how we got so far down the line. No matter how long the war lasts, I do not believe that the members of Section 3 will lose any of their native ways, attitudes, or tastes. They will remain just as American as ever. Why, they still fight for a can of American tobacco or a box of cigarettes that comes from the States, when such a rare and appreciated article does turn up, and papers and magazines from home are sure to go the rounds, finding themselves at length in the hands of English-reading soldiers in the trenches. I never could understand the intense grip that the game of baseball seems to possess, but it holds to some members of the Section with a cruel pertinacity. One very dark night, a few days ago, two of us were waiting at an advanced poste de secours. The rifle and artillery fire was constant, illuminating rockets shot into the air, and now and then one could distinguish the heavy dull roar of a mine or torpille detonating in the trenches. War in all its engrossing detail was very close. Suddenly my friend turned to me and, with a sigh, remarked, "Gee! I wish I knew how the Red Sox were making out! " Well, there may be more interesting things in the future to write of the Americans serving at the front, and, again, their work may become dull. But it makes no difference to the Section. The men will do what is asked and gladly, for there is no work more worth while than helping in some way, no matter what, this noblest of all causes. One does not look for thanks---there is a reward enough in the satisfaction the work gives; but the French do not let it stop at that. The men from the trenches are surprised that we have voluntarily undertaken such a hazardous occupation, and express their appreciation and gratitude with almost embarrassing frequency. "You render a great service," say the officers, and those of highest rank call to render thanks in the name of France. It is good to feel that one's endeavors are appreciated, and encouraging to hear the words of praise; but when, at the end of an evacuation, one draws a stretcher from the car, and the poor wounded man lying upon it, who has never allowed a groan to escape during a ride that must have been painful, with an effort holds out his hand, grasps yours, and, forcing a smile, murmurs, "Merci"---that is what urges you to hurry back for other wounded, to be glad that there is a risk to one's self in helping them, and to feel grateful that you have the opportunity to serve the brave French people in their sublime struggle. 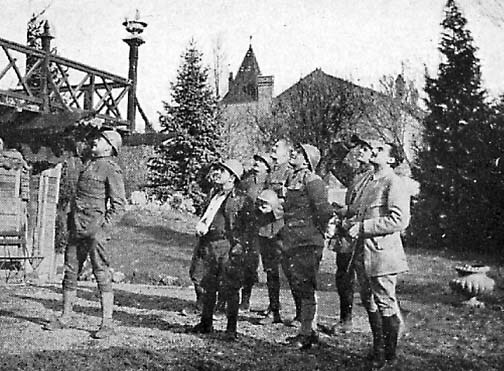 "OUR artillery and automobiles have saved Verdun," French officers and soldiers were continually telling me. And as I look back on two months of ambulance-driving in the attack, it seems to me that automobiles played a larger part than even the famous "seventy-fives," for without motor transport there would have been no ammunition and no food. One shell, accurately placed, will put a railway communication out of the running, but automobiles must be picked off one by one as they come within range. The picture of the attack that will stay with me always is that of the Grande Route north from Bar-le-Duc, covered with the snow and ice of the last days of February. The road was always filled with two columns of trucks, one going north and the other coming south. The trucks, loaded with troops, shells, and bread, rolled and bobbled back and forth with the graceless, uncertain strength of baby elephants. It was almost impossible to steer them on the icy roads. Many of them fell by the wayside, overturned, burned up, or were left apparently unnoticed in the ceaseless tide of traffic that never seemed to hurry or to stop. All night and all day it continued. Soon the roads began to wear out. Trucks brought stones from the ruins of the battle of the Marne and sprinkled them in the ruts and holes; soldiers, dodging in and out of the moving cars, broke and packed the stones or sprinkled sand on the ice-covered hillsides. But the traffic was never stopped for any of these things. The continuous supply had its effect on the demand. There were more troops than were needed for the trenches, so they camped along the road or in the fields. Lines of camions ran off the road and unloaded the reserve of bread; the same thing was done with the meat, which kept well enough in the snow; and the shells, which a simple camouflage of white tarpaulins effectually hid from the enemy airmen. At night, on the main road, I have watched for hours the dimmed lights of the camions, winding away north and south like the coils of some giant and luminous snake which never stopped and never ended. It was impressive evidence of a great organization that depended and was founded on the initiative of its members. Behind each light was a unit, the driver, whose momentary negligence might throw the whole line into confusion. Yet there were no fixed rules to save him from using his brain quickly and surely as each crisis presented itself. He must be continually awake to avoid any one of a thousand possible mischances. The holes and ice on the road, his skidding car, the cars passing in the same and opposite directions, the cars in front and behind, the cars broken down on the sides of the road --- all these and many other things he had to consider before using brake or throttle in making his way along. Often snow and sleet storms were added to make driving more difficult. Objects six feet away were completely invisible, and it was only by watching the trees along the side of the road that one could attempt to steer. I was connected with the Service des Autos as a driver in Section No 2 of the Field Service of the American Ambulance of Neuilly. We had the usual French Section of twenty ambulances and one staff car, but, unlike the other Sections, we had only one man to a car. There were two officers, one the Chief of Section, Walter Lovell, a graduate of Harvard University and formerly a member of the Boston Stock Exchange; and George Roeder, Mechanical Officer, in charge of the supply of parts and the repair of cars. Before the war, he was a promising bacteriologist in the Rockefeller Institute. Our Section was one of five which compose the Field Service of the American Ambulance, and are located at various points along the front from Dunkirk to the Vosges. The general direction of the Field Service is in the hands of A. Piatt Andrew, formerly professor at Harvard and Assistant Secretary of the United States Treasury. He has organized the system by which volunteers and funds are obtained in America, and is the responsible link between the work of the Service and the will of the French authorities. In each of the five Sections there are twenty drivers, all Americans and volunteers. Most of them are college men who have come over from the United States to "do their bit" for France and see the war at the same time. Certainly our Section was gathered from the four corners of the "States." One, a graduate of the University of Pennsylvania, had worked for two years on the Panama Canal as an engineer; another, an Alaskan, had brought two hundred dogs over for the French Government, to be used for transportation in the Vosges; a third was a well-known American novelist who had left his home at Florence to be a chauffeur for France. There were also two architects, a New York undertaker, several soi-disant students, and a man who owned a Mexican ranch that was not sufficiently flourishing to keep him at home. The term of service required by the French authorities is now six months, though, of course, some of the men have been in the Section since the battle of the Marne. We all get five sous a day and rations as privates in the French army, which was represented in our midst by a lieutenant, a maréchal de logis, a mechanic, and a cook. On February 22 our French lieutenant gave us our "order to move," but all he could tell us about our destination was that we were going north. We started from Bar-le-Duc about noon, and it took us six hours to make forty miles through roads covered with snow, swarming with troops, and all but blocked by convoys of food carts and sections of trucks. Of course, we knew that there was an attack in the neighborhood of Verdun, but we did not know who was making it or how it was going. Then about four o'clock in the short winter twilight we passed two or three regiments of French colonial troops on the march with all their field equipment. I knew who and what they were by the curious Eastern smell that I had always before associated with camels and circuses. They were lined up on each side of the road around their soup kitchens, which were smoking busily, and I had a good look at them as we drove along. It was the first time I had seen an African army in the field, and though they had had a long march, they were cheerful and in high spirits at the prospect of battle. They were all young, active men, and of all colors and complexions, from blue-eyed blonds to shiny blacks. They all wore khaki and brown shrapnel casques bearing the trumpet insignia of the French sharpshooter. We were greeted with laughter and chaff, for the most part, in an unknown chatter, but now and again some one would say, "Hee, hee, Ambulance Américaine," or "Yes, Ingliish, good-bye." I was fortunate enough to pick up one of their noncommissioned officers with a bad foot who was going our way. He was born in Africa, which accounted for his serving in the colonials, though his mother was American and his father French. From him I learned that the Germans were attacking at Verdun, and that, to every one's surprise, they were trying to drive the point of the salient south instead of cutting it off from east to west. As we were passing along, one of his men shouted something to him about riding in an ambulance, and I remarked that they all seemed in a very good humor. "Oh yes," he answered; "we're glad to be on the move, as we've been en repos since autumn in a small quiet place south of Paris." "But it means trouble," he added proudly, "their sending us up, for we are never used except in attacks, and were being saved for the summer. Six hundred have been killed in my company since the beginning, so I have seen something of this war. Now my regiment is mixed up with two others, and altogether we make about four thousand men." As we talked, I realized that his was a different philosophy from that of the ordinary poilu that I had been carrying. Certainly he loved France and was at war for her; but soldiering was his business and fighting was his life. Nothing else counted. He had long since given up any thought of coming out alive, so the ordinary limitations of life and death did not affect him. He wanted to fight and last as long as possible to leave a famous name in his regiment, and to add as many citations as possible to the three medals he had already gained. He was the only man I ever met who was really eager to get back to the trenches, and he said to me with a smile when I stopped to let him off, "Thanks for the lift, mon vieux, but I hope you don't have to carry me back." After that we rode north along the Meuse, through a beautiful country where the snow-covered hills, with their sky-lines of carefully pruned French trees, made me think of masterpieces of Japanese art. In the many little villages there was much excitement and activity with troops, artillery, and munitions being rushed through to the front, and the consequent wild rumors of great attacks and victories. Curiously enough, there were few who thought of defeat. They were all sure, even when a retreat was reported, that the French were winning, and that spirit of confidence had much to do with stopping the Germans. At about six in the evening we reached our destination some forty miles northeast of Bar-le-Duc. The little village where we stopped had been a railroad centre until the day before, when the Germans started bombarding it. Now the town was evacuated, and the smoking station deserted. The place had ceased to exist, except for a hospital which was established on the southern edge of the town in a lovely old château, overlooking the Meuse. We were called up to the hospital as soon as we arrived to take such wounded as could be moved to the nearest available rail-head, which was ten miles away, on the main road, and four miles south of Verdun. We started out in convoy, but with the then conditions of traffic, it was impossible to stick together, and it took some of us till five o'clock the next morning to make the trip. That was the beginning of the attack for us, and the work of "evacuating" the wounded to the railway stations went steadily on until March 15. It was left to the driver to decide how many trips it was physically possible for him to make in each twenty-four hours. There were more wounded than could be carried, and no one could be certain of keeping any kind of schedule with the roads as they then were. Sometimes we spent five or six hours waiting at a cross-road, while columns of troops and their equipment filed steadily by. Sometimes at night we could make a trip in two hours that had taken us ten in daylight. Sometimes, too, we crawled slowly to a station only to find it deserted, shells falling, and the hospital moved to some still more distant point of the line. Situations and conditions changed from day to day --- almost from hour to hour. One day it was sunshine and spring, with roads six inches deep in mud, no traffic, and nothing to remind one of war, except the wounded in the car and the distant roar of the guns, which sounded like a giant beating a carpet. The next day it was winter again, with mud turned to ice, the roads blocked with troops, and the Germans turning hell loose with their heavy guns. In such a crisis as those first days around Verdun, ammunition and fresh men are the all-essential things. The wounded are the déchets, the "has-beens," and so must take second place. But the French are too gallant and tender-hearted not to make sacrifices. I remember one morning I was slapped off the road into a ditch with a broken axle, while passing a solitary camion. The driver got down, came over, and apologized for the accident, which was easily half my fault. Then we unloaded four cases of "seventy-five" shells that he was carrying, and put my three wounded in on the floor of his car. He set out slowly and carefully up the ice-covered road, saying to me with a smile as he left, "Don't let the Boches get my marmites while I'm gone." For some time I sat there alone on the road, watching the shells break on a hill some miles away to the north, and wondering when I could get word of my mishap back to the base. Then a staff car appeared down the road making its way along slowly and with difficulty, because, being without chains, it skidded humorously with engine racing and the chauffeur trying vainly to steer. There was a captain of the Service des Autos sitting on, the front seat, and he was so immaculately clean and well groomed that he seemed far away from work of any kind. But when the car stopped completely about halfway up the little hill on which I was broken down, he jumped out, took off his fur coat, and using it to give the rear wheels a grip on the ice, he swung it under the car. As the wheels passed over it, he picked it up and swung it under again. So the car climbed the hill and slid down the other slope round the curve and out of sight. It was just another incident that made me realize the spirit and energy of the French Automobile Service. But the captain had not solved any of my difficulties. He had been too busy to notice me or wonder why an American ambulance was sprawled in a ditch with four cases of shells alongside. I had been waiting there in the road about two hours when another American came by and took back word of my accident and of the parts necessary to set it right. Then about noon my friend came back in his camion to take up his cases of shells and report my wounded safe at the railway station. We lunched together on the front seat of the camion on bread, tinned "monkey meat," and red wine, while he told me stories about his life as a driver. He had been on his car then for more than twenty days without leaving it for food or sleep. That morning his "partner" had been wounded by a shell, so he had to drive all that day alone. Usually the two men drive two hours, turn and turn about; while one is driving, the other can eat, sleep, or read the day before yesterday's newspaper. The French camions are organized in sections of twenty. Usually each section works in convoy, and has its name and mark painted on its cars. I saw some with elephants or ships, some with hearts or diamonds, clubs or spades, some with dice --- in fact, every imaginable symbol has been used to distinguish the thousands of sections in the service. The driver told me there were more than ten thousand trucks working between Verdun and Bar-le-Duc. There is great rivalry between the men of the several sections in matters of speed and load --- especially between the sections of French and those of American or Italian cars. The American product has the record for speed, which is, however, offset by its frequent need of repair. My friend told me about trips he had made up as far as the third-line trenches, and how they were using seventy-fives "like machine-guns in dug-outs, where the shells were fired at "zero," so that they exploded immediately after leaving the mouth of the gun. The French, he said, would rather lose guns than men, and according to him, there were so many guns placed in the "live" parts of the Sector that the wheels touched, and so formed a continuous line. As soon as we had finished lunch he left me, and I waited for another two hours until the American staff car (in other surroundings I should call it an ordinary Ford touring-car with a red cross or so added) came along loaded with an extra "rear construction," and driven by the Chief himself. It took us another four hours to remove my battered rear axle and put in the new parts, but my car was back in service by midnight. That was a typical instance of the kind of accident that was happening, and there were about three "Ford casualties" every day. Thanks to the simplicity of the mechanism of the Ford, and to the fact that, with the necessary spare parts, the most serious indisposition can be remedied in a few hours, our Section has been at the front for a year --- ten months in the Bois-le-Prêtre, and two months at Verdun --- without being sent back out of service for general repairs. In the Bois-le-Prêtre we had carried the wounded from the dressing-stations to the first hospital, while at Verdun we. were on service from the hospital to the rail-heads. In this latter work of évacuation the trips were much longer, thirty to ninety miles, so the strain on the cars was correspondingly greater. As our cars, being small and fast, carried only three wounded on stretchers or five seated, our relative efficiency was low in comparison with the wear and tear of the "running-gear" and the amount of oil and petrol used. But in the period from February 22 to March 13, twenty days, with an average of eighteen cars working, we carried 2046 wounded 18,915 miles. This would be no record on good open roads, but with the conditions I have already described I think it justified the existence of our volunteer organization --- if it needed justification. Certainly the French thought so, but they are too generous to be good judges. Except for our experiences on the road, there was little romance in the daily routine. True, we were under shell fire, and had to sleep in our cars or in a much-inhabited hayloft, and eat in a little inn, half farmhouse and half stable, where the food was none too good and the cooking none too clean, but we all realized that the men in the trenches would have made of such conditions a luxurious paradise, so that kept us from thinking of it as anything more than a rather strenuous "camping out." During the first days of the attack, the roads were filled with refugees from the town of Verdun and the country north of it. As soon as the bombardment started, civilians were given five hours to leave, and we saw them --- old men, women, and children --- struggling along through the snow on their way south. It was but another of those sad migrations that occur so often in the zone des armées. The journey was made difficult and often dangerous for them by the columns of skidding trucks, so the more timid took to the fields or the ditches at the roadside. They were for the most part the petits bourgeois who had kept their shops open until the last minute, to make the town gay for the troops, who filed through the. Promenade de la Digue in an endless queue on their way to and from the trenches. Most of them had saved nothing but the clothes on their backs, though I saw one old woman courageously trundling a barrow overflowing with laces, post-cards, bonbons (doubtless the famous Dragées verdunoises), and other similar things which had been part of her stock-in-trade, and with which she would establish a Verdun souvenir shop when she found her new home. There were many peasant carts loaded with every imaginable article of household goods from stoves to bird cages; but no matter what else a cart might contain, there was always a mattress with the members of the family, old and young, bouncing along on top. So ubiquitous was this mattress that I asked about it, and was told that the French peasant considers it the most important of his Lares, for it is there his babies are born and his old people die --- there, too, is the family bank, the hiding-place for the bas de laine. All the people, no matter what their. class or station, were excited. Some were resigned, some weeping, some quarrelling, but every face reflected terror and suffering, for these derelicts had been suddenly torn from the ruins of their old homes and their old lives after passing through two days of the heaviest bombardment the world has ever seen. I did not wonder at their grief or terror when I had seen the town from which they fled. Sometimes it is quiet, with no shells and no excitement; at others it is a raging hell, a modern Pompeii in the ruining. Often I passed through the town, hearing and seeing nothing to suggest that any enemy artillery was within range. But one morning I went up to take a doctor to a near-by hospital, and had just passed under one of the lovely old twelfth-century gates, with its moat and towers, when the Germans began their morning hate. I counted one hundred and fifty shells, arrivés, in the first quarter of an hour. After making my way up on the old fortifications in the northeastern quarter, I had an excellent view of the whole city --- a typical garrison town of northern France spreading over its canals and river up to the Citadel and Cathedral on the heights. Five and six shells were shrieking overhead at the same time, and a corresponding number of houses in the centre of the town going up in dust and débris, one after another, almost as fast as I could count. During this bedlam a military gendarme strolled up as unconcerned as if he had been looking out for a stranger in the Champs Elysées. He told me about a dug-out that was somewhere "around the corner." But we both got so interested watching the shells and their effect that we stayed where we were. The gendarme had been in the town long enough to become an authority on bombardments, and he could tell me the different shells and what they were hitting, from the colored smoke which rose after each explosion and hung like a pall over the town in the windless spring air. When the shells fell on the Cathedral --- often there were three breaking on and around it at the same time --- there sprang up a white cloud, while on the red tiles and zinc roofs they exploded in brilliant pink-and-yellow puffs. The air was filled with the smell of the burning celluloid and coal-tar products used in the manufacture of the high explosive and incendiary shells. It was very impressive, and even my friend the gendarme said, "C'est chic, n'est-ce pas? It is the heaviest rain we have had for several days." Then he pointed to the left where a column of flame and smoke, heavier than that from the shells, was rising, and said, "Watch them now, and you'll understand their system, the cochons. That's a house set afire with their incendiary shells, and now they will throw shrapnel around it to keep our firemen from putting it out." And so they did, for I could see the white puffs of the six-inch shrapnel shells breaking in and around the column of black smoke, which grew denser all the time. Then two German Taubes, taking advantage of the smoke, came over and dropped bombs, for no other reason than to add terror to the confusion. But the eighty firemen, a brave little band brought up from Paris with their hose-carts and engine, refused to be confused or terrified. Under the shells and smoke we could see the streams of water playing on the burning house. "They are working from the cellars," said the gendarme. It was fortunate there was no wind, for that house was doomed, and but for the fact that all the buildings were stone, the fire would have spread over all that quarter of the town despite the gallantry of the firemen. The bombardment continued steadily for about two hours and a half, until several houses were well alight and many others completely destroyed. Then about noon it stopped as suddenly as it had started. I wanted to go down and watch the firemen work, but the gendarme, who had produced an excellent bottle of no ordinary pinard, said, "Wait a while, mon vieux, that is part of the system. They have only stopped to let the people come out. In a few minutes it will start again, when they will have more chance of killing somebody." But for once he was wrong, and after waiting with him for half an hour, I went down to the first house I had seen catch fire. The firemen were still there, working with hose and axe to prevent the fire from spreading. The four walls of the house were still standing, but inside there was nothing but a furnace which glowed and leaped into flame with every draught of air, so that the sparks flew over the neighboring houses, and started other fires which the firemen were busy controlling. These pompiers are no longer civilians. The black uniform and gay brass and leather helmet of Paris fashion have been replaced with the blue-gray of the poilu, with the regulation steel shrapnel casque or bourguignotte. The French press has had many accounts of their heroism since the beginning of the attack. Certainly if any of the town is left, it will be due to their efforts among the ruins. There are only eighty of them in the town. Half of them are men too old for "active service," yet they have stayed there for two months working night and day under the shells, with the strain of the bombardment added to the usual dangers from falling walls and fire. They are still as gay and eager as ever. Their spirit and motto is the same as that of every soldier and civilian who is doing hard work in these hard times. They all say, "It is war," or more often, "It is for France." I left them saving what they could of the house, and walked on over the river through the town. It is truly the Abomination of Desolation. The air was heavy and hot with the smell of explosives and the smoke from the smouldering ruins. Not a sound broke the absolute quiet and not a soul was in sight. I saw two dogs and a cat all slinking about on the search for food, and evidently so crazed with terror that they could not leave their old homes. Finally, crossing over the canal, where the theatre, now a heap of broken beams and stones, used to stand, I met an old bearded Territorial leaning over the bridge with a net in his hand to dip out fish killed by the explosion of the shells in the water. He did not worry about the danger of his position on the bridge, and, like all true fishermen, when they have had good luck, he was happy and philosophical. "One must live," said he, "and it's very amiable of the Boches to keep us in fish with their marmites, n'est-ce pas, mon vieux?" We chatted for a while of bombardments, falling walls, and whether the Germans would reach Verdun. He, of course, like every soldier in that region, was volubly sure they would not. Then I went up on the hill towards the Cathedral, by the old library, which was standing with doors and windows wide open, and with the well-ordered books still on the tables and in the shelves. As yet it is untouched by fire or shell, but too near the bridge to escape for long. I continued my way through streets filled with fallen wires, broken glass, and bits of shell. Here and there were dead horses and broken wagons caught in passing to or from the lines. There is nothing but ruins left of the lovely residential quarter below the Cathedral. The remaining walls of the houses, gutted by flame and shell, stand in a wavering line along a street, blocked with debris, and with furniture and household articles that the firemen have saved. The furniture is as safe in the middle of the street as anywhere else in the town. As I passed along I could hear from time to time the crash and roar of falling walls, and see the rising clouds of white stone dust that has settled thickly everywhere. The Cathedral, with its Bishop's Palace and cloisters, --- all fine old structures of which the foundations were laid in the eleventh and twelfth centuries, --- must; from its commanding position overlooking the town, be singled out for destruction. I watched ten shells strike the Cathedral that one morning, and some of them were the terrible 380's, the shells of the sixteen-inch mortars, which make no noise as they approach and tear through to the ground before their explosion. The interior of the Cathedral, blurred with a half-inch layer of stone dust, is in most "unchurchly" disorder. Four or five shells have torn large holes through the roof of the nave, and twice as many more have played havoc with the chapels and aisles at the side. One has fallen through the gilded canopy over the high altar and broken one of the four supporting columns, which before were monoliths like those of St. Peter's at Rome. Of course, most of the stained-glass windows are scattered in fragments over the floor, and through the openings on the southern side I could see the ruins of the cloisters, with some chairs and a bed literally falling into them from a room of the Bishop's Palace above. This destruction of the Cathedral is typical of the purposeless barbarity of the whole proceeding. The wiping out of the town can serve no military purpose. There are no stores of munitions or railway communications to be demolished. Naturally there are no troops quartered in the town, and now all extensive movements of convoys are conducted by other roads than those leading through the town. Yet the bombardment continues day after day, and week after week. The Germans are sending in about £5,000,000 worth of shells a month. "It's spite," a poilu said to me; "they have made up their minds to destroy the town since they can't capture it; but it will be very valuable as an iron mine after the war." Since the writing of this chapter, five Sections of the Ambulance have been sent to the vicinity of Verdun: Section 3 to the region about Douaumont; Section 4 to Mort Homme; Section 8 to the neighborhood of the fortress of Vaux; Section 2 to the immediate neighborhood of Verdun; and Section 1 to the region of Fort Souville and Fort St. Michel. IT gave us rather a wrench to leave Pont-à-Mousson. The Section had been quartered there since April, 1915, and we were attached to the quaint town and to the friends we had made. The morning of our departure was warm and clear. Walking along the convoy, which had formed in the road before our villa, came the poilus, and shook hands with each conducteur. "Au revoir, monsieur." "Au revoir, Paul." "Bonne chance, Pierre! " We took a last look at the town which had sheltered us, at the scene of the most dramatic moments in our lives. Above the tragic silhouette of a huddle of ruined houses rose the grassy slopes of the great ridge crowned by the Bois-le Prêtre, the rosy morning mists were lifting from the shell-shattered trees, a golden sun poured down a spring-like radiance. Suddenly a great cloud of grayish white smoke rose over the haggard wood and melted slowly away in the northeast wind; an instant later, a reverberating boom signalled the explosion of a mine in the trenches. There was a shrill whistle, our lieutenant raised his hand, and the convoy swung down the road to Dieulouard. "Au revoir les Américains!" cried our friends. A little, mud-slopped, blue-helmeted handful, they waved to us till we turned the corner. "Au revoir, les Américains!" We left Pont-à-Mousson imagining that our Section was in for a month's repairing and tinkering at the military motor park, but as we came towards B. our opinion changed. We began to pass file after file of troops, many of them the khaki-clad troupes d'attaque, bull-necked Zouaves, and wiry, fine-featured Arabs. A regiment was halted at a crossroad; some of the men had taken off their jackets and hung them to the cross-beam of a wayside crucifix. On the grass before it, in the circle of shade made by the four trees which pious Meusian custom here plants round a Calvaire, sprawled several powerful-looking fellows; one lay flat on his belly with his face in his Turkish cap. Hard by, in a little copse, the regimental kitchen was smoking and steaming away. A hunger-breeding smell of la soupe, la bonne soupe, assailed our nostrils. Quite by himself, an older man was skilfully cutting a slice of bread with a shiny, curved knife. Th e rooks eddied above the bare brown fields. Just below was a village with a great cloud of wood smoke hanging over it. Late in the afternoon we were assigned quarters in the barracks of B. At B. we found an English Section that had been as suddenly displaced as our own. Every minute loaded camions ground into town and disappeared towards the east, troops of. all kinds came in, flick, flack, the sun shining on the barrels of the lebels, a train of giant mortars, mounted on titanic trucks and drawn by big motor lorries, crashed over the pavements and vanished somewhere. Some of our conducteurs made friends with the English drivers, and swapped opinions as to what was in the wind. One heard, "Well, those Frenchies have got something up their sleeve. We were in the battle of Champarng, and it began just like this." A voice from our American West began, "Say --- what kind of carburetors do you birds use?" New England asked, "How many cars have you got?" And London, on being shown the stretcher arrangements of our cars, exclaimed, "That ain't so dusty, --- eh, wot?" Round us, rising to the full sea of the battle, the tide of war surged and disappeared. At dusk a company of dragoons, big helmeted men on big horses, trotted by, their blue mantles and mediaeval casques giving them the air of crusaders. At night the important corners of the streets were lit with cloth transparencies, with "Verdun" and a great black arrow painted on them. Night and day, going as smoothly as if they were linked by an invisible chain, went the hundred convoys of motor lorries. There was a sense of something great in the air ---a sense of apprehension. "Les Boches vont attaquer Verdun." On the 21st the order came to go to M. The Boches had made their first attack that morning; this, however, we did not know. At M., a rather unlovely eighteenth-century château stands in a park built out on the meadows of the Meuse. The flooded river flowed round the dark pines. At night one could hear the water roaring under the bridges. The château, which had been a hospital since the beginning of the war, reeked with ether and iodoform; pasty-faced, tired attendants unloaded mud, cloth, bandages, and blood that turned out to be human beings; an overwrought doctor-in-chief screamed contradictory orders at everybody, and flared into crises of hysterical rage. Ambulance after ambulance came from the lines full of clients; kindly hands pulled out the stretchers, and bore them to the wash-room. This was in the cellar of the dove-cote, in a kind of salt-shaker turret. Snip, snap went the scissors of the brancardiers, who looked after the bath, --- good souls these two; the uniforms were slit from mangled limbs. The wounded lay naked in their stretchers while the attendant daubed them with a hot soapy sponge; the blood ran from their wounds through the stretcher to the floor, and seeped into the cracks of the stones. A lean, bearded man, closed his eyes over the agony of his opened entrails and died there. I thought of Henner's dead Christ. Outside, mingling with the roaring of the river, came the great, terrible drumming of the bombardment. An endless file of troops were passing down the great road. Night came on. Our ambulances were in a little side street at right angles to the great road; their lamps flares beat fiercely on a little section of the great highway. Suddenly, plunging out of the darkness into the intense radiance of the acetylene beams, came a battery of 75's, the helmeted men leaning over on the horses, the guns rattling and the harness clanking, a swift picture of movement that plunged again into darkness. And with the darkness, the whole horizon became brilliant with cannon fire. We were well within the horseshoe of German fire that surrounded the French lines. It was between midnight and one o'clock, the sky was deep and clear, with big ice-blue winter stars. We halted at a certain road to wait our chance to deliver our wounded. It was a mêlée of beams of light, of voices, of obscure motions, sounds. Refugees wept by, decent people in black, the women being escorted by a soldier. One saw sad, harassed faces. A woman came out of the turmoil, carrying a cat in a canary cage; the animal swept the gilded bars with curved claws, and its eyes shone black and crazily. Others went by pushing baby carriages full to the brim with knick-knacks and packages. Some pushed a kind of barrow. At the very edge of earth and sky was a kind of violet-white inferno, the thousand finger-like jabs of the artillery shot unceasing to the stars, the great semicircular aureole flares of the shorter pieces were seen a hundred times a minute. Over the moorland came a terrible roaring such as a river might make tumbling through some subterranean abyss. A few miles below, a dull, ruddy smouldering in the sky told of fires in Verdun. The morning clouded over, the dawn brought snow. Even in the daytime the great cannon flashes could be seen in the low, brownish snow-clouds. On the way to M., two horses that had died of exhaustion lay in a frozen ditch. Ravens, driven from their repast by the storm, cawed hungrily in the trees. We slept in the loft of one of the buildings that formed the left wing of the courtyard of the castle. To enter it, we had to pass through a kind of lumberroom on the ground floor in which the hospital coffins were kept. Above was a great, dim loft, rich in a greasy, stably smell, a smell of horses and sweaty leather, the odor of a dirty harness room. At the end of the room, on a kind of raised platform, was the straw in which we lay; a crazy, sagging shelf, covered with oily dust, bundles of clothes, knapsacks, books, candle ends, and steel helmets, ran along the wall over our heads. All night long, the horses underneath us squealed, pounded, and kicked. I see in the lilac dawn of a winter morning the yellow light of an officer's lantern, and hear the call, "Up, boys---there's a call to B." The bundles in the dirty blankets groan; unshaven, unwashed faces turn tired eyes to the lantern; some, completely worn out, lie in a kind of sleepy stupor. A wicked, screaming whistle passes over our heads, and the shell, bursting on a nearby location, startles the dawn. The snow begins to fall again. The river has fallen, and the air is sickish with the dank smell of the uncovered meadows. A regiment on the way to the front has encamped just beyond the hospital. The men are trying to build little shelters. A handful of fagots is blazing in the angle of two walls; a handful of grave-faced men stand round it, stamping their feet. In the hospital yard, the stretcher-bearers unload the body of an officer who has died in the ambulance. The dead man's face is very calm and peaceful, though the bandages indicate terrible wounds. The cannon flashes still jab the snowy sky. The back of the attack is broken, and we are beginning to get a little rest. During the first week our cars averaged runs of two hundred miles a day. And this over roads chewed to pieces, and through the most difficult traffic. In one of the places, there was a formidable shell gantlet to run. This morning I drove to B. with a poilu. He asked me what I did en civil. I told him. "I am a pâtissier," he replied. "When this business is over, we shall have some cakes together in my good warm shop, and my wife shall make us some chocolate." He gave me his address. A regiment of young men marched singing down the moorland road to the battle-line. "Ah, les braves enfants! " said the pastry cook.